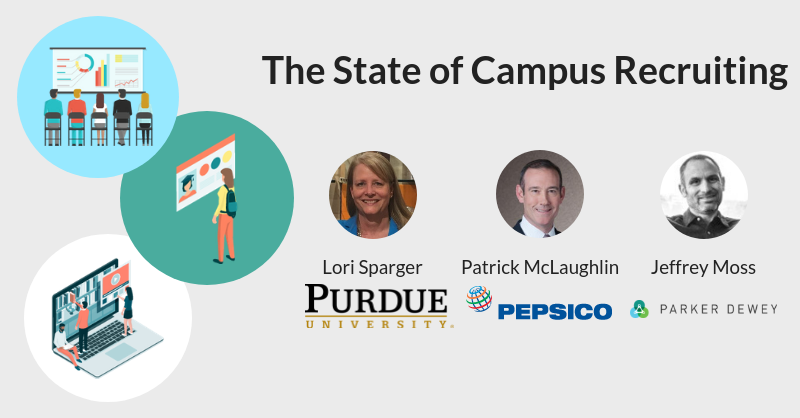 At Parker Dewey, we hear daily from companies and universities about the different challenges they each face tied to campus recruiting. While each side is unique, we've seen that both parties have the same end goal, but often struggle to find collaborative ways to improve outcomes for the companies and students alike. So we invited university and recruiting leaders to get candid and share the ways they are overcoming challenges of campus to career transitions. Listen to the replay here or download the mp3 file below. During this moderated discussion, Parker Dewey founder Jeffrey Moss was joined by Patrick McLaughlin and Lori Sparger. Patrick is the Senior Vice President and Chief Human Resources Officer of PepsiCo, and been at the forefront of diversity and inclusion initiatives, leading Pepsi’s equality efforts. Lori is the Chief Operating Officer at Purdue University’s College of Liberal Arts. In addition to her role at COO, Lori is also Chief Innovation Officer and launched the Liberal Arts Career Center and Cornerstone program to demonstrate the skills learned from a Liberal Arts education. Patrick shared the main benefit of hiring college graduates is not their degree, but their ability to "learn how to learn." He highlighted how degree programs prepare Career Launchers to interact in the workplace, take on leadership roles, and build social skills that are critical to successful campus to career transitions. Likewise, Lori emphasized that all recruiters should be open minded about kinds of students they need, as is done by PepsiCo. By looking beyond major and taking a deeper look at course work, extracurriculars, and experiences, recruiters will find the top applicants from a wider pool. One of the biggest challenges recruiters face is pushback from hiring managers, especially when it comes to increasing diversity. People instinctively want to look for someone like themselves, and so Patrick noted the importance of having a diverse recruiting team. In addition, Patrick shared the key to overcoming this challenge would be to equip your recruiting team to be open minded and look for truly great experiences beyond the resume that aren't necessarily reflected in a field of study. In particular, first generation and diverse students are negatively impacted by current campus recruiting strategies. Lori shared that at Purdue, because these student come in with different sets of social capital, they try to create opportunities for them to build their networks like connecting students directly with alum and encouraging participating in Micro-Internships to see what the work really entails. The career fair isn’t going away, but Patrick emphasized that with so many new ways to interact, traditional campus recruiting strategies need supplements. Patrick noted that at PepsiCo, they “find ways to show up in students lives outside of the career center.” Specifically, Patrick explained that Career Launchers are in search of opportunities to interact with a company’s employees in real ways. Some companies may shy away from this, worried that deeper interactions beyond info sessions could turn applicants off, but for PepsiCo Patrick says that's ok - they aren't right for everybody and it's better students know that early. For higher ed, Lori points out that there is a language disconnect between both Career Launchers and employers, and the need for both parties to improve. "We tell students you need to talk about why you'd be good for the company, not why it would be a good move for you," but companies also need to be better at articulating what they need. "Strong communication skills" is a skill seen on job descriptions across roles and industries, but doesn't explain the intricacies and differentiators between the skills needed to succeed in a PR role versus a sales role. Buzzwords need to be spelled out for college graduates launching their career. Fortunately both companies and the colleges recognize that the path to improving this is not “slides and free lunches,” nor is it upending the current college experience. In fact, the biggest opportunity is providing more ways for students to understand a company’s culture and highlight why their skills (developed both inside and outside of the classroom) align to a role. At the same time, companies can find more ways to look beyond just the academic pedigree, and complement the traditional campus recruiting process to see the skills not captured in a student’s GPA or major. Listen to the complete replay and stay tuned for future calls where we’ll bring together university and recruiting leaders for their perspective.